This past month, All Star was able to produce a type of highlight video that we have never created before; a reunion highlight video. The majority of the footage for this piece was captured and digitized off of video tapes 20 years old. Needless to say, piecing together and editing this project was both an awesome and a very different experience. 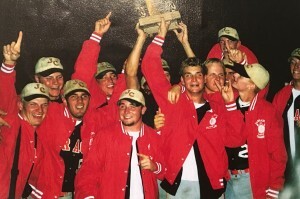 Twenty years ago, a competitive baseball team named JC Brager captured the Class A State Championship trophy in Nebraska. Player Nate Lindstrom and head coach Mike Dobbs, members of the JC Brager championship squad, reached out to us this past month asking for help to produce a highlight video for their 20 year reunion banquet. Never had All Star been a part of a keepsake video that reached as far back as this one did. We were ecstatic at the prospect of producing this kind of highlight video. Footage from 4 DV tapes and 1 audio cassette tape from 1997 were digitized to help piece the project together. Most of the DV tape footage consisted of game footage throughout JC Brager’s season, as well as footage of the actual state championship game when they won it all. 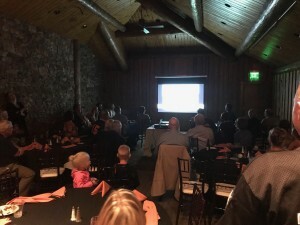 There was also footage of Brager’s celebratory pep rally on the football field of their high school, their championship banquet, and some footage of their trip to the Regional Tournament. The audio cassette tape consisted of 20 minutes of the broadcast from the state championship game being called. Editing the old video and audio footage together was a fun experience. Virtually all of the video we work with today is in HD. Being that most of this project’s footage was shot in SD, the process of digitizing all of the video alone took a few days. Then, figuring out how to properly color correct, resize, sharpen, export and finally edit all of the SD footage together also took a few full days of work. All in all, getting to create something like this for a momentous event that occurred so many years earlier, was outstanding.